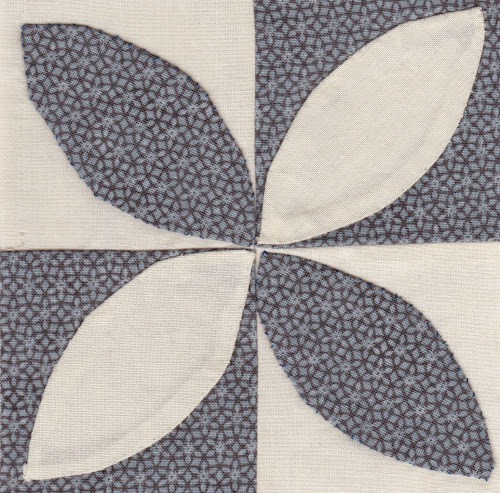 The second appliqué block in Dear Jane and I’m happier with it than with block A03 though I still need to polish up my appliqué skills. 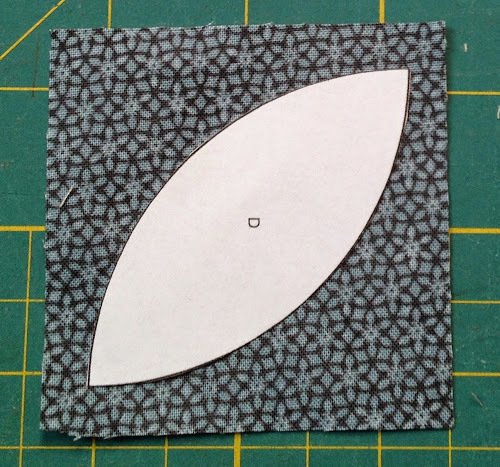 I must admit that working with a larger size of melon, as these petal or wedge-like shapes are called, was far easier than working with the tiny melons in block A03. 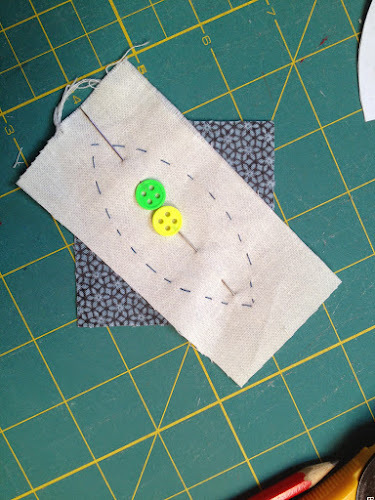 The appliqué method I used is explained below. 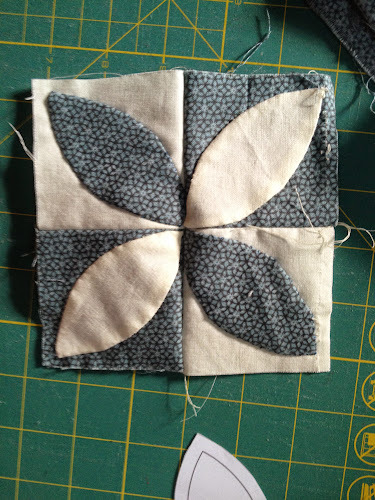 I came across the technique in some website I forgot the name after struggling with needleturn appliqué in block 3. 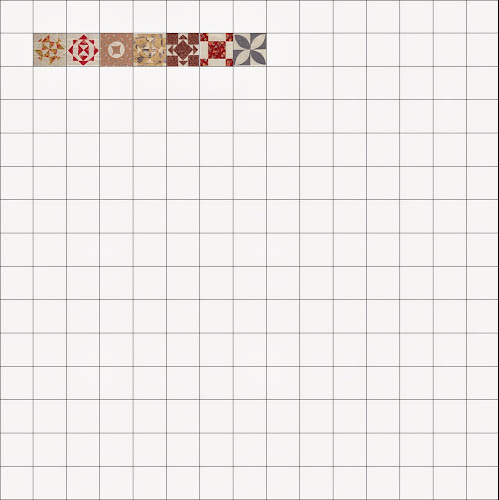 I cut the background squares 1/8 in larger than specified in Susan Gatewood’s pattern. 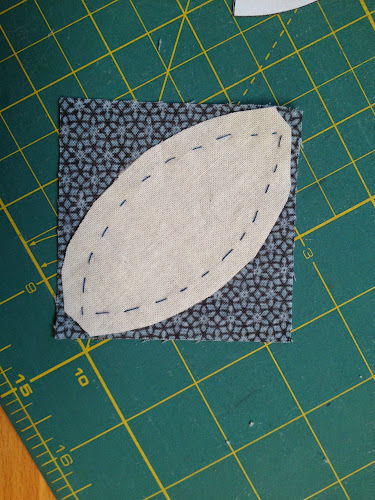 Cut out the melon without the seam allowance. 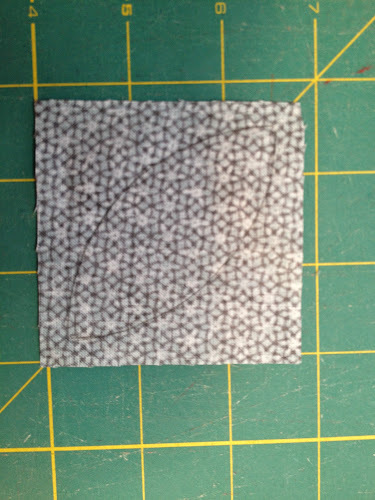 Trace the pattern on the back of the fabric. 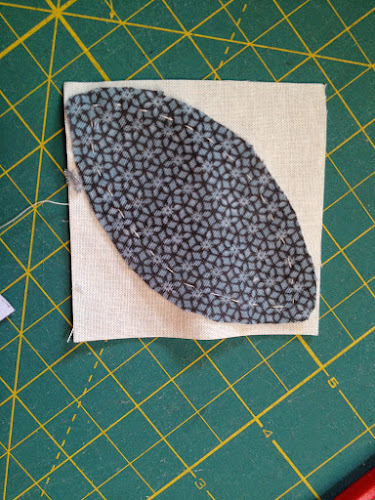 Now place a piece of fabric over the right side of the background fabric. 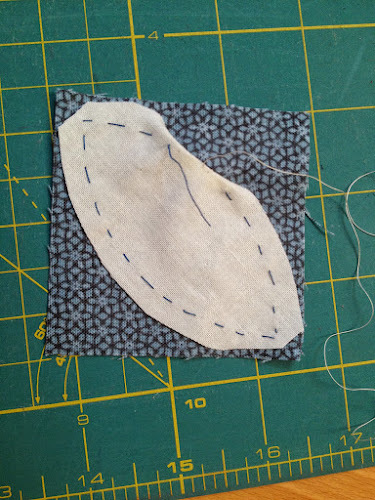 The applique piece has to be as large as the melon including the seam allowance. 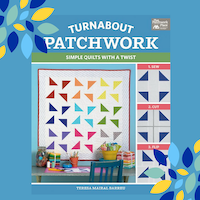 Pin the piece to the background. 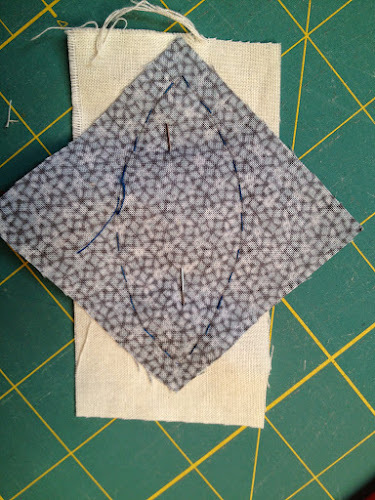 Now baste along the traced line on the wrong side of the background fabric. When you turn the piece over this is what you have. 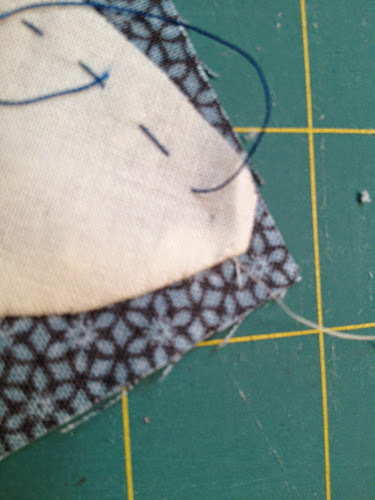 Trim around the basting leaving 1/4 in seam allowance. 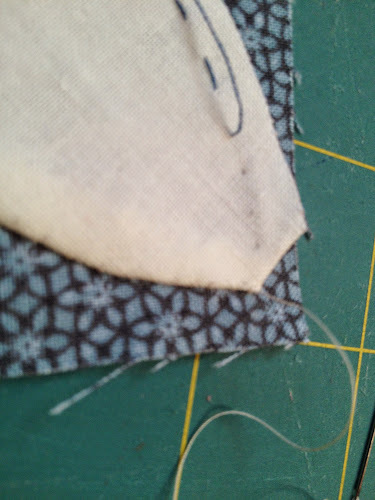 Trim the corners too to decrease the bulk when doing the applique. Now start removing the basting and turn on the basting line and start to applique as per needleturn technique. 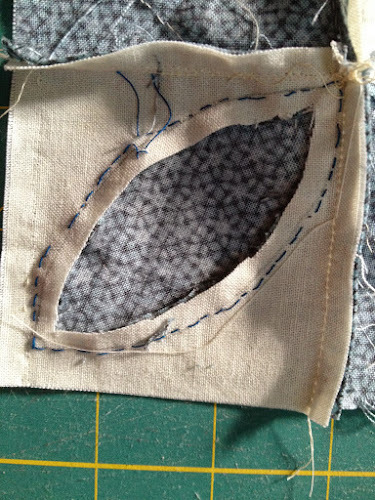 On some fabrics and with good daylight you will be able to see the holes from the basting thread. 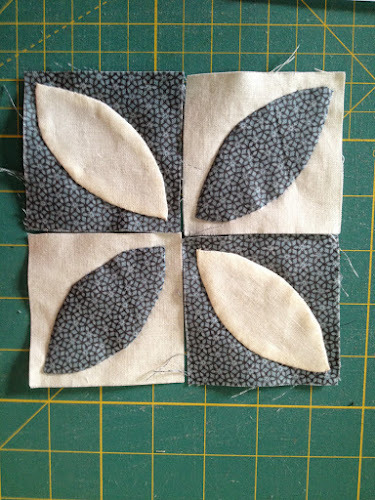 To get a good pointy melon fold as per picture when you reach the point and then continue as per needleturn applique. Now and then, as required remove the basting thread a couple of stitches. 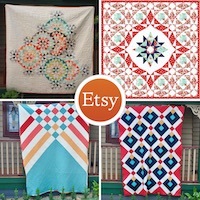 And so on until all of them are done. 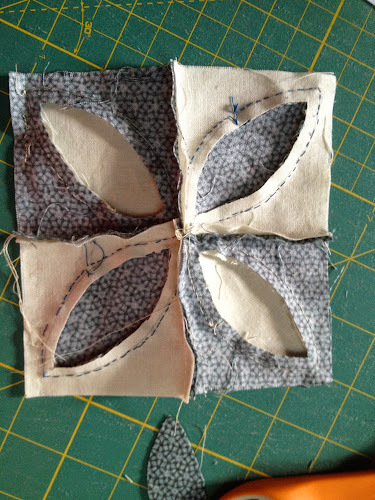 To stitch together ensure all applique endings meet. 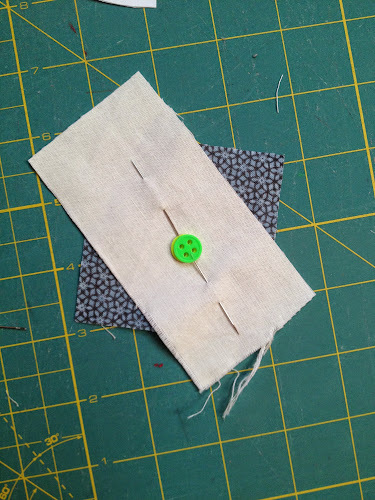 Use a needle to match corners if necessary. 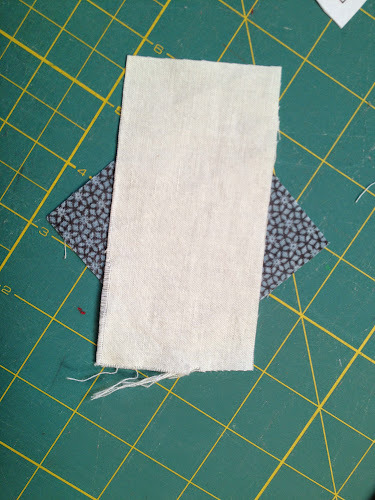 I cut out the excess fabric from the background fabric. I found the melons to be a bit large for the background square size provided by Susan. 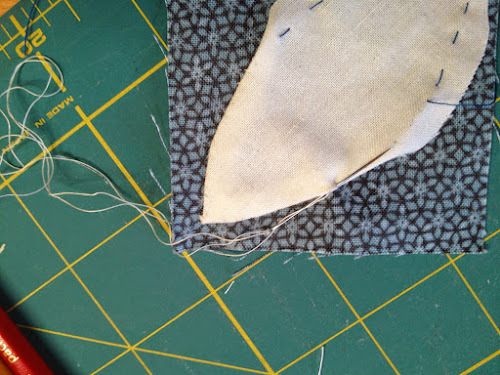 I was a bit concerned I wouldn’t be able to get a 1/4 seam allowance and that the melon would be caught in the seam when assembling the block. At the end everything worked out.